A LABOUR SENATOR who sustained serious head injuries over the weekend remains in a critical but stable condition in hospital tonight. 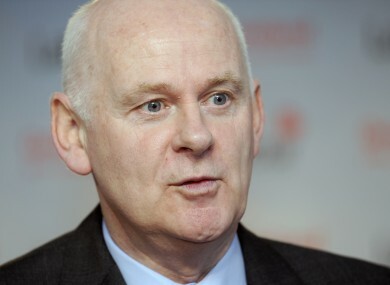 Labour’s Jimmy Harte was found unconscious at Newmarket Square in Dublin at around 4am in the early hours of Saturday morning after sustaining serious injuries in what is now believed to have been an accidental fall. Harte had attended the Republic of Ireland’s 3-0 win over Latvia at the Aviva Stadium earlier on Friday night and is believed to have been heading home after socialising with family and friends. Harte was taken to St James’s Hospital but later transferred to Beaumont Hospital where he was put into an induced coma and received treatment. Speaking on Highland Radio earlier, the Mayor of Letterkenny, Pascal Blake, said that hundreds of people had been in touch with him to wish Harte well. A Labour spokesperson confirmed earlier that the senator remains in a critical but stable condition and said they are hopeful of a quick and full recovery. “His family have been encouraged and heartened by all the messages of support they have received in recent days,” he said. An avid soccer fan and sports enthusiast, Harte is a popular figure around Leinster House and politicians from all sides of the house have been quick to offer their sympathies. Harte joined Labour in 2010 and contested the 2011 general election in Donegal North East. He failed to win a seat, coming fourth in the three-seat constituency. But he was elected to the Seanad Industrial and Commercial Panel in April of that year. Email “Labour Senator Jimmy Harte remains in critical but stable condition ”. Feedback on “Labour Senator Jimmy Harte remains in critical but stable condition ”.